Welcome to our new “If you like Downton Abbey” series. Every Monday we will bring you more books like Downton Abbey. Each of the following books are hot off the press and, most importantly, all have a big crumbling estate, an Aga stove (what the heck is an Aga anyway? ), and a good-looking protagonist. Downton Abbey at its finest. Enjoy! And here’s Week 2 of books like Downton Abbey! Week 3 can be found here, Week 4 is here , Week 5 is here and Week 6 is here. A touch of Upstairs Downstairs combined with Downton Abbey and World War I, The Last Summer is a fabulous read. I must say that my vision of Tom, the housekeeper’s son, is one of Matthew Crowley in Downton Abbey! Gallery Books provided a review copy of this book. All opinions are my own. 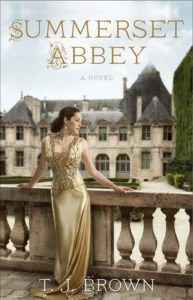 Summerset Abbey by T.J. Brown is yet another fabulous Downton Abbey-esque read that just came out. Fortunately for us, this book is the first of a series and I’m already ready for the next! We hope you will join us on February 6th at 8pm on Twitter to discuss Hemingway’s Girl with the author Erika Robuck. Here is the info. Also, we hope you join us on March 5th to discuss Wife 22 with Melanie Gideon. Click here to enter to win the book. Simon and Schuster provided a review copy of this book. All opinions are my own. Great list! I need to check them out. Plus, you should take a look at Brideshead Revisited written by Evelyn Waugh. Was a miniseries in 81 with Jeremy Irons, Anthony Andrews, Claire Bloom, Laurence Olivier, John Geilgud. Was a must-see show in my home. Love Summerset Abbey… can’t wait for book 2! I have never heard of these books, and they are right up my alley! I’ve also gotten my mother in law and mother obsessed with Downton, so I’ll tell them about these books, too. Cheers! Thank you for this list!! I love Downton Abbey and need to put these on my list to read. Thank you so much!!! Love this list! Going to buy at least two of these! Long live Downton Abbey. Great list! I have a book on my stacks that might be a candidate for those who like Downton Abbey. I haven’t read it yet myself, so can’t say for sure. The House at Tyneford by Natasha Solomons. I love this! Now I need to find a way to get my hands on all these books! The Moreland Dynasty by Cynthia Harrold Eagles, 35 books from the 1600’s to present day are a must read if you like DA. I started reading “The last Summer”Thursday night, and had to finish it. Could not put it down. Great choice!! An AGA is a cooker/range/stove. It is a brand name of a cooking appliance. They were simple, basic to outrageously monstrous and elegant. I came across your site via pinterest. I love Downton Abbey and the books you are listing. I recently wrote two books of a series I plan on continuing. I did not want to list them on your site without your consent, but I feel they fit right in with the list you are offering. I did not include my website as I am treading lightly (my intention is not to spam your site). If you are interested, I will gladly send you my website that includes the first four chapters of my book. I am an avid fan of Downton Abbey, and looking for something to read/watch when this fabulous series comes to an end. Thank you for this link!